Following the three-day protest stay away, which was ostensibly given as meant to register disquiet over the prevailing economic challenges, the South African controversial Economic Freedom Fighters (EFF) leader, Julius Malema latched on to the local anti-Government elements' unsubstantiated narrative that Government allegedly used excessive force in dealing with some errant protestors. He went on to claim that the President was similar to his predecessor, Robert Mugabe. Yes, President Mnangagwa worked with Mugabe and shared the same party with him but the two are totally different politicians and individuals altogether. Just parroting anti-ZANU PF statements paradoxically made Malema a small man politically instead of making him the giant who can lecture even foreign leaders. Malema is a strange character indeed. Faced with an election, the guy has all time to throw statements at the people across the Limpopo River while he has not done enough on the ground to endear the EFF and himself to the South African people. Although the South African President, Cyril Ramaphosa is set to announce soon the election date, the South African election management body, the Independent Electoral Commission (IEC) has already indicated that the polls may be held in May and other smaller parties in South Africa are already seriously canvassing for support among the electorate ahead of the elections. Not so for Malema who has to catapult a volley of words across the river to President Emmerson Mnangagwa first before campaigning. However, one is not surprised by his uncalled for statement. The moment he fell afoul of the former South African President, Jacob Zuma and turned his guns on him, he earned some applause in some quarters of South Africa. 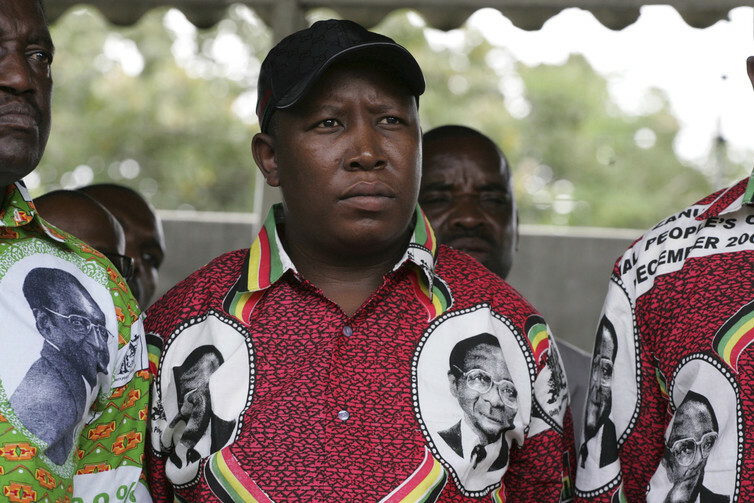 After travelling to Zimbabwe twice before and hailing from the Limpopo Province, Malema is already confusing all that as enough sources of popularity and relevance to the Zimbabwean polity to harangue President Mnangagwa. He may be running for the highest office in South Africa but he is not there yet to tell President Mnangagwa how to run Zimbabwe. Even President Ramaphosa has never done that. The kind of confusion that Malema has is what the Igbo tribe of Nigeria would describe as one that wears a hat. Only a few years ago he was friends with Mugabe thanks to the former Minister of Youth Development, Indigenisation and Economic Empowerment, Saviour Kasukuwere's facilitation. He showered Mugabe with praises over the land reform after touring a farm in Mashonaland West Province. He worshipped the ground that the former leader walked on. The moment he was out of office he was among the first ones to give Mugabe some tongue lashing accusing him of forgetting to, like a good dancer, leave the dancing arena on time. That is Julius Malema for you, a loose cannon. When Malema issues statements on Zimbabwe one immediately gets the impression that he is a faultless politician who can dispense rebuke and censure from a pedestal of political perfection. Nothing is further from the truth. In 2013, his incomplete Sandton mansion was auctioned for R5.9 million and so was his Polokwane house which went under the hammer for R1.4 million. His cabbage and tomato farm in Limpopo Province suffered the same fate and was sold for R2.5 million. Why: The all-knowing and "powerful" opposition politician owed the South African tax collector, the South African Revenue Service (SARS), R16 million in unpaid taxes. The same politician who failed to manage his personal affairs to the extent of failing to do the most basic of things – paying one's taxes is also gunning for that country's top position and already wantonly dispensing censure to regional leaders. This brings to mind another diplomatic b00b where while still African National Congress Youth League (ANCY) Chairperson, Malema in 2011 said that the then Botswana President Ian Khama and his Botswana Democratic Party (BDP) were a "foot stool of imperialism and a security threat to Africa". He went on to call for a regime change in that country and proposed that ANCYL creates a command team to unite the opposition in Botswana as part of his bid to unseat Khama. Despite playing the South African political policeman-in-chief over Zuma's spending on his Nkandla residence and calling him a thief in parliament, Malema's hands are not so clean after all. An investigation carried into the affairs of the collapse of the VBS Mutual Bank established that Malema received R1.8 million and additional R430 000 in illicit funds from the financial institution which is now facing liquidation. The investigation also found out that some of the money was channelled towards his Sandton home. Despite wearing red work suits, miners' hard hats and maid's outfits in parliament to stress their quest to build South Africa and associate with that country's struggling working class, Malema and Shivambu's shenanigans exposed them for who they were - people who use the poor's plight for self-enrichment. It is abundantly clear that such pretenders to the people's champion title have no moral ground to momentarily forget their looting ways to lecture leaders of President Mnangagwa's calibre and history. When Zimbabwe requires advice from South Africa it will knock on the door of the right person - President Ramaphosa - and not attention seekers in the person of Malema. In the meantime, Malema should concentrate on the uphill task of convincing South Africans to vote for the EFF given its leadership's not-so-exemplary behaviour over the party's very short history of just five and half years.